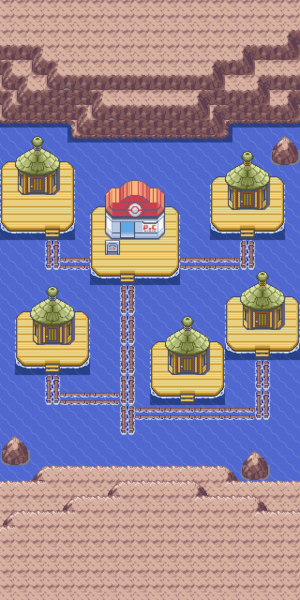 An ordinary town in Hoenn, Pacifidlog town does have a few noteworthy stuff. Every week, a gentleman in a house will give you a TM depending on the happiness of your Pokémon: TM21 (Frustration) if happiness is low, TM27 (Return) if happiness is high. In Ruby/Sapphire a woman will trade a corsola for a bellossom. In Pokémon Emerald a man will trade a horsea for a bagon. The people here tell many legends, of a dragon that never needs to rest, and of sealed-away Pokémon that represents powers of ice, steel, and rock. There's also a citizen that looks for Mirage Island, and will shout out in excitement when it appears. If you talk to the women living in the house south to the Pokémon Center, she will offer to trade Pokémon with you. The Pokémon she asks for, and the one she gives you, depends on the version you are playing. In Ruby and Sapphire, she will ask for a Bellossom in exchange for a Corsola. Note that you can get a Bellossom by evolving Gloom if desired. In Emerald she will offer you a Horsea for your Bagon. Note that you can get a Bagon in the Meteor Falls if desired. This page was last edited on 27 November 2018, at 05:46. This page has been accessed 49,042 times.